This isn't supposed to be a mega serious super image. I was resting the camera on the roof of the car - no tripod or any other sophisticated astrophotography equipment. I stacked it all in k3ccdtools and here is what you get. The summer moon is often seen bobbing between the trees and houses as it travels it low path through the sky. It is now, at the end of august, that we start to really notice how bright the moon can be. For the last 3 months, what with a lack of astronomical darkness and the low position of the eliptic in the sky, we've almost forgot the blazing power of a full moon to really much up our astrophotography. 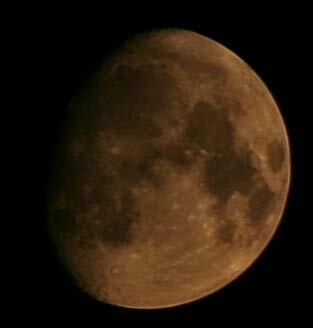 The moon is away pretty, but no friend of us telescope touting astrophotographers. Mind you- all astrophotographers have a bash at imaging it at some point or other in their career. I don't image lunar stuff much at all these days - but some guys get some fantastic shots. Personally I put it all in the same bucket as planetary imaging - don't touch it with a barge pole!